PERRYSVILLE, OHIO – James Blue of Fayetteville, N.C. is driving happier this holiday season — in his new 2015 Jeep Wrangler Sport 4×4. 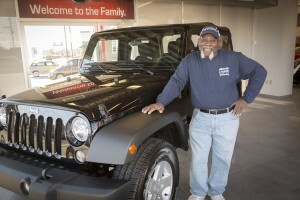 The senior service technician with Wade Hardin Plumbing won the Jeep as the grand prize in the Ultimate Summit Sweepstakes sponsored by Mansfield Plumbing. Blue was entered in the sweepstakes by his plumbing wholesaler, Hubbard Pipe and Supply, during the summer promotion. For every Summit toilet he purchased for his customers, he was entered for a chance to win. After working for 32 years at Wade Hardin Plumbing, the team there says the prize couldn’t have been awarded to a more deserving employee. “James has an incredible work ethic,” says Wade Hardin, owner of Wade Hardin Plumbing in Fayetteville, N.C. “He’s an asset to our team and we’re thrilled he’s receiving the Jeep. Even the morning he got the Jeep, he kept looking at his watch because he didn’t want to be late to an afternoon plumbing job! Mansfield Plumbing sponsored the Ultimate Summit Sweepstakes from June 1 – September 30, 2015 for licensed plumbers and contractors purchasing Summit toilets through their local wholesalers. In addition to the grand prize of the Jeep Wrangler, there were five Weber Genesis Gas Grills, 10 prizes of $100 gift certificates to Texas Roadhouse and 50 prizes of folding buck knives awarded. In a concurrent promotion, wholesale distributors of Summit toilets were able to participate in a Scratch n’ Win promotion during the summer months, receiving a game card for every Summit toilet ordered from Mansfield Plumbing. Hundreds of prizes were awarded, with cash totaling more than $20,000. The $5,000 grand prize Scratch n’ Win card was won by the team at R.A. Townsend Company in Alpena, Michigan.